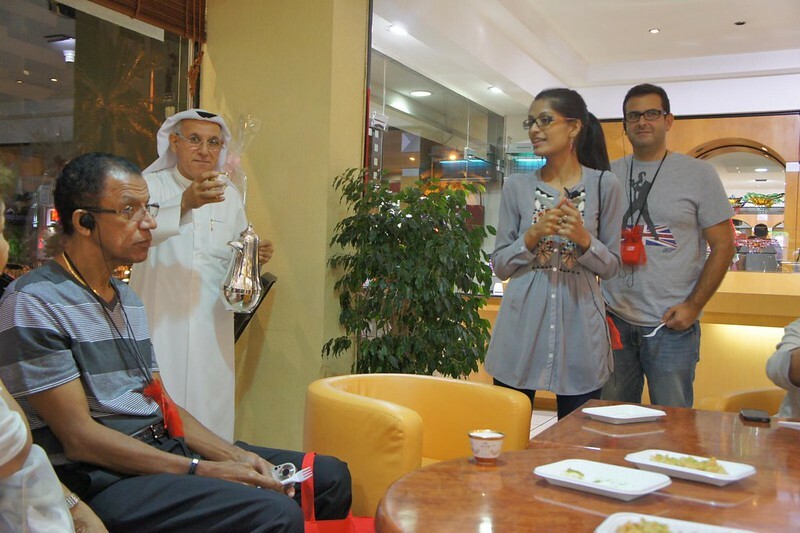 green tea: Dubai Food Tour with Frying Pan Adventures! 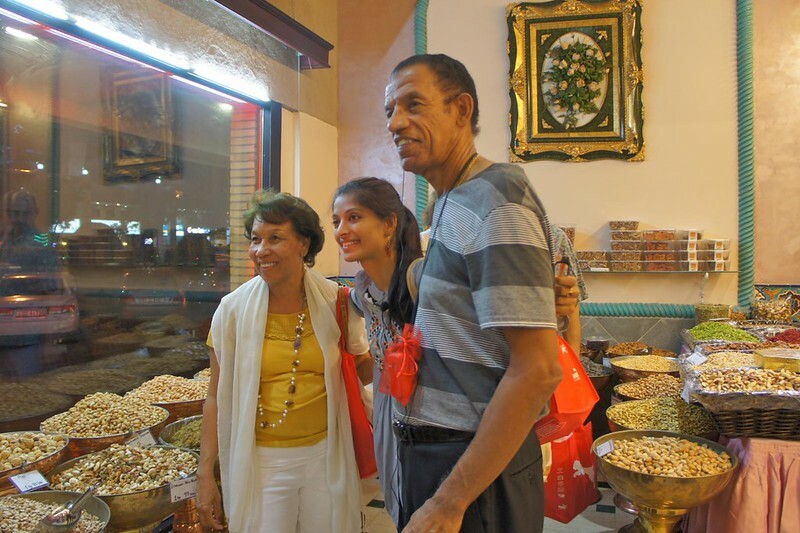 Dubai Food Tour with Frying Pan Adventures! When I visit someplace for a short amount of time, I hesitate to write about it in that authoritative travel blogger tone. I'm not an expert on the destination and I feel like a fraud pretending that I am. Here's the exception: I spent only three days in Dubai but I feel confident in writing that you've absolutely got to take a Frying Pan Adventures food tour if you visit the city. Frying Pan Adventures was founded by Arva who writes about the Dubai food scene on her highly regarded blog "I Live in a Frying Pan". I have to respect anyone who takes their blog to a higher level and Arva has done that brilliantly by establishing Frying Pan Adventures. Although this is a relatively new venture, Arva's tours are already ranked as the #1 Activity in Dubai on TripAdvisor, with 234 five star reviews so far. This is a review of the Middle Eastern Food Pilgrimage. Frying Pan Adventures is more than an eating event. At each stop, Arva teaches about the culture, heritage, customs, ingredients and even etiquette of the different Middle Eastern regions. She also offers insight into the migration of people from around the world into the Emirates, the reason for the high density of good eats in the Diera neighbourhood of Dubai. Next stop: the show that is the Egyptian pizza shop! This dish is called feteer: the baker tosses around the dough to make it as thin as possible, then he stretches it out on a marble counter, smears on some cheese, folds the thing over itself a few times, adds more cheese, folds it again then he slides it into the oven. Fast, fast. And tasty, too. The proprietor of Al Samadi Sweets offers me a cup of Arabic coffee. 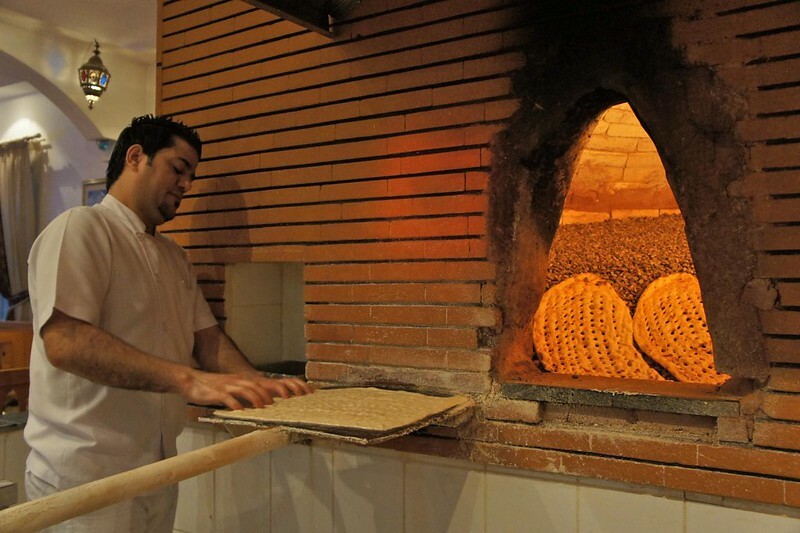 At Al Samadi Sweets, Arva teaches about the complex and contentious origins of baklava over a cup of traditional Arabic coffee (I assume it's an acquired taste...). 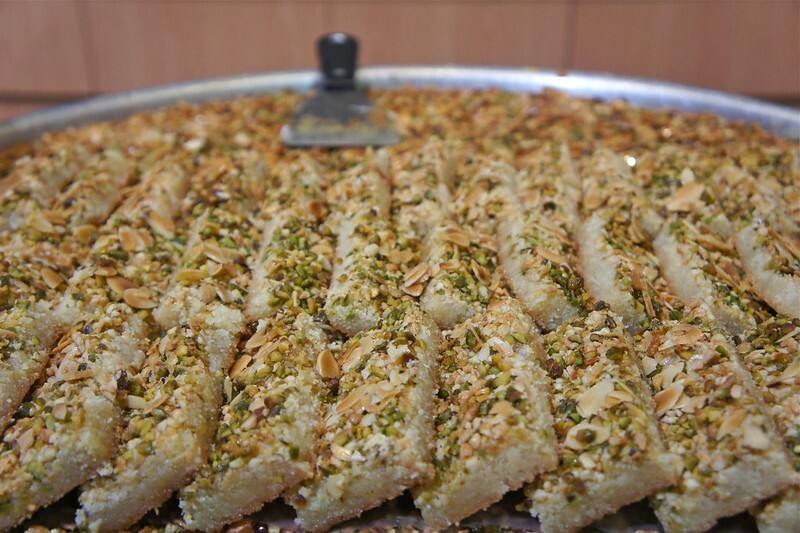 The famous baklava from Al Samadi is made with 18 layers of filo! Arva also trains us to recognize the different types of ma'amoul biscuits based on their decorative motifs. We taste delicate pastries rolled with sweet cheese and rosewater, biscuits with various nut fillings and a whipped meringue made from the root of the soapwart tree. Half of us like the meringue and half of us do not. Of course, I liked it! 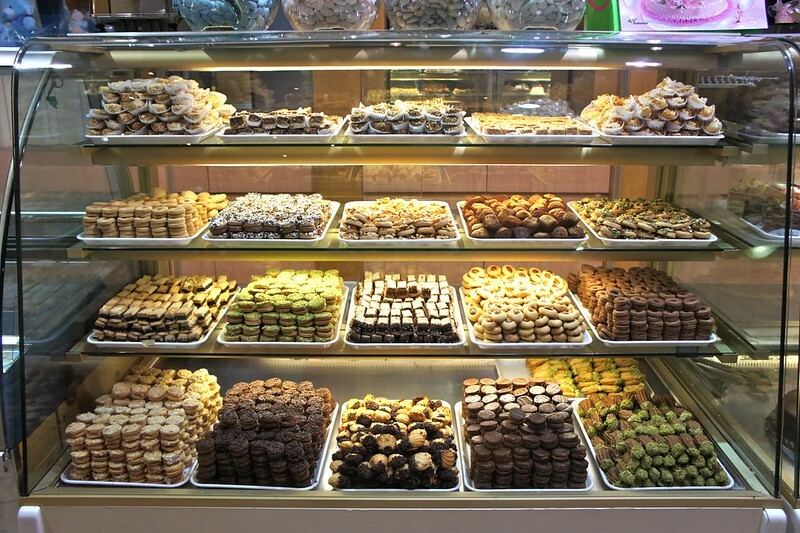 It is at a Syrian sweets shop called Asail Al Sham that I have my favourite bite of the night. 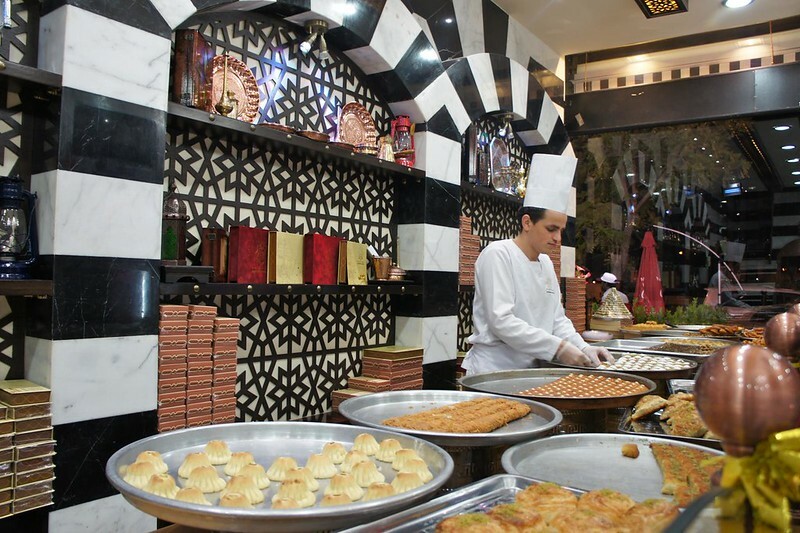 Asail Al Sham is a beautiful shop, ornate with black and white marble and geometric patterns, not to mention the many trays of artful pastries. It's the Syrian-style ice cream, booza, that I get excited about. We watch ice cream being pounded into shape in a chilled cauldron and then rolled in pistachios. We are each served a small slice. The booza is dense and bordering on chewy, almost a hybrid of ice cream and marshmallow, with a perfume-y essence. I am still thinking about booza months later, upset that my search for Syrian ice cream in Ontario has come up empty. 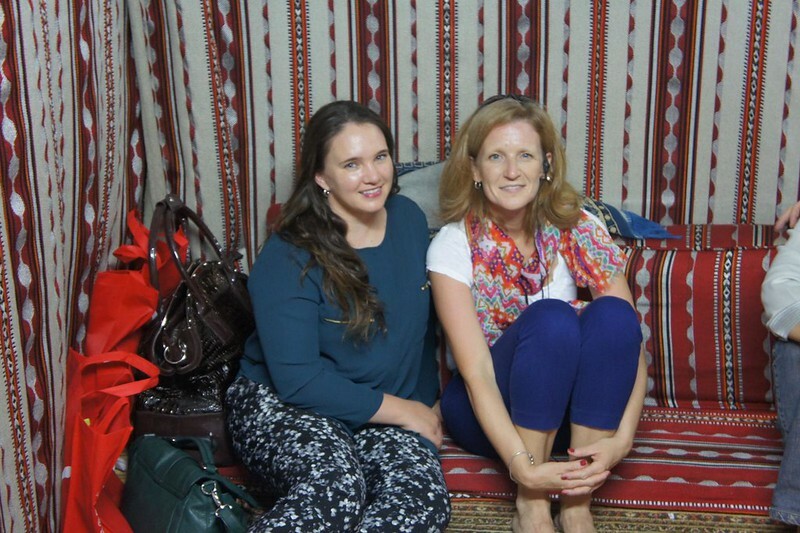 Moving on: our group takes over the the Bedouin tent room at Yemeni restaurant Al Tawasol. Kneeling over the large platters, we help ourselves to mandi - rice and meat which was slow-cooked in the ground. The lamb is exceptionally tender and the rice has absorbed so much flavour while slow cooking. Cousins, comfy on the majilis. There are two more quick stops along the way: we check out a spice shop where Arva tells us how to choose the best quality ingredients like saffron (hint: don't buy the dusty, sun-exposed stuff from the tourist souqs). We also sneak into an Iraqi restaurant, Kabab Erbil on Al Rigga Road, to see the unique method of cooking Iraq's national dish, masqouf (Tigris River carp). The large fish is cut open into a flat butterfly which is propped upright beside a fire to smoke and then placed directly on coals to cook and caramelize for up to three hours. Our final stop, Abshar Restaurant, is the most refined of the night with its white tablecloths and fine china. This is an Iranian restaurant. Arva tells us that the place is usually very lively with music and singing but tonight it is quiet and nearly empty because the Persian community is in mourning for a recently passed notable person. After a restless four hours up and down the sidewalks of Diera, I don't mind a calm moment. We get a close look at loaves of long, holey bread (sangak) being baked in an oven filled with hot pebbles then hung up on nails to cool off. Arva talks about the complexity of Persian cuisine which prizes sour flavours and perfectly cooked rice. We try some of that sangak with a delicate roasted eggplant dish. I could go for more if my stomach were not on the verge of bursting. 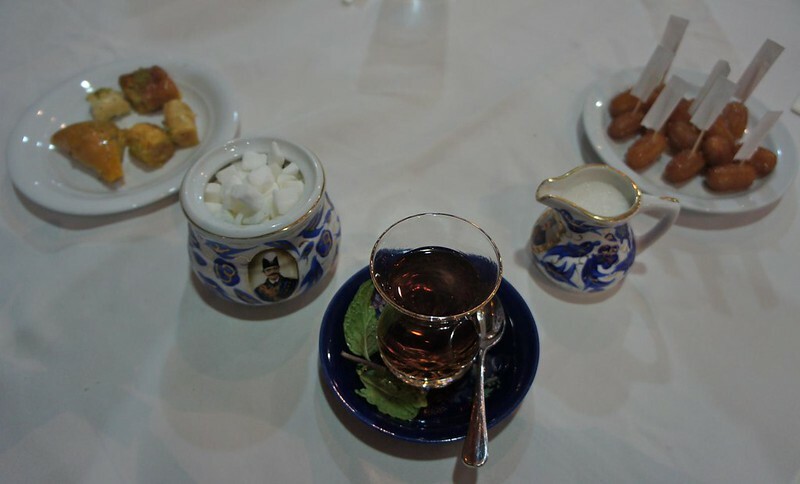 We finish off the night with Persian mint tea (chai) and hey, more desserts! At the end of the night, my brain is just as full as my belly. Arva managed to teach us so much about history, culture and politics of the region while we were munching our way around Diera. She has left me with a lot to think about as well as a mandate to seek out my newly discovered Arabic favourites when I return home to Toronto. 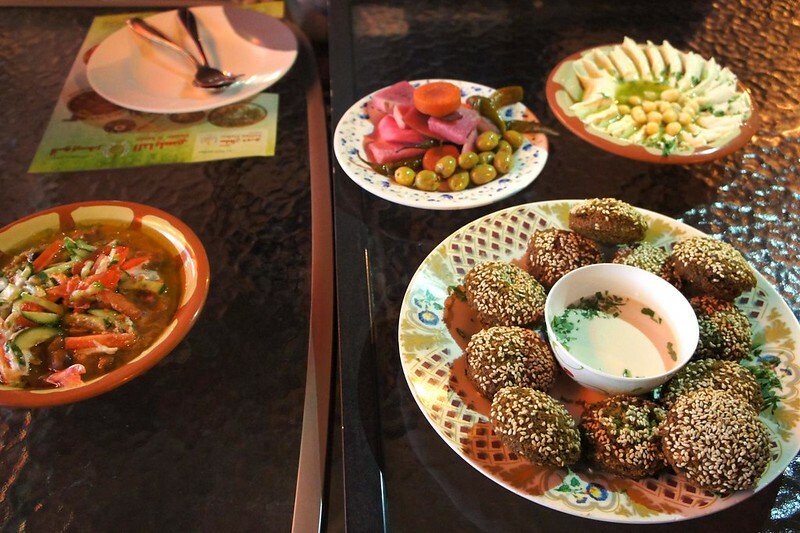 The Middle Eastern Food Pilgrimage walking tour costs 415 AED per person and includes more food than the average human can deal with. Several other tours are offered, see more info here. I suggest booking early. That looks like a fantastic tour. 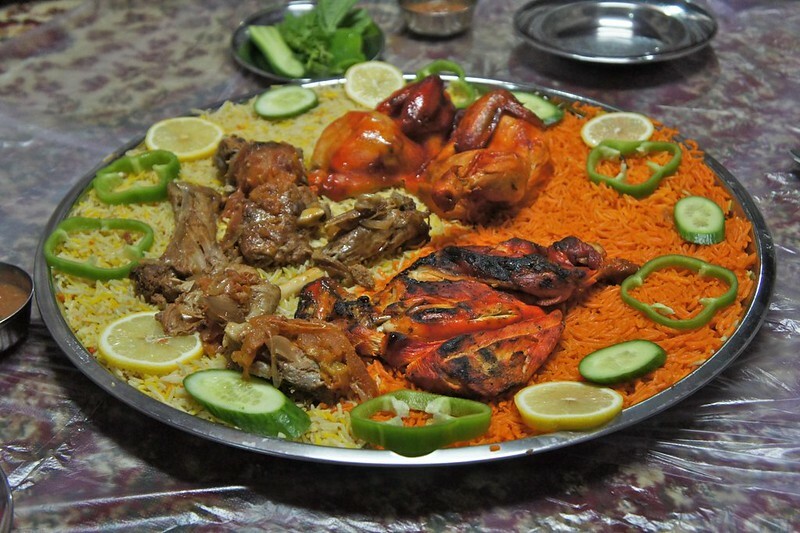 I love middle eastern food, reading this post and looking at the photos has made me incredibly hungry. I think the closest I could get locally is Lebanese food... that might have to do.